Protesters gathered at police headquarters in Dallas to speak out against the shooting death of a black man by a white officer who says she mistook his apartment for hers. The Dallas Morning News reports that community activists organized the rally Monday to protest last week’s shooting of 26-year-old Botham Jean. Officer Amber Guyger was arrested Sunday on a manslaughter charge and released on bond. An arrest affidavit that gives a narrative of what happened was released Monday. It appeared to be based almost entirely on the officer’s account. Attorneys for Jean’s family say it’s “self-serving” and contradicts neighbors’ accounts. Several dozen protesters blocked traffic as they marched about half a mile from police headquarters. They were also denouncing the fatal shooting of a man by a security guard on Sept. 1. Police, some on horseback, followed. Officers fired pepper balls to help control the crowd at one point. The rally ended back at the headquarters. Leaders asked protesters to return for another rally Wednesday. Attorneys for the family of a black man shot dead by a white Dallas police officer in the man’s own home say the arrest affidavit contradicts neighbors’ accounts. The affidavit prepared by a Texas Ranger was released Monday and appeared to be based almost entirely on Officer Amber Guyger’s account of the shooting of 26-year-old Botham Jean. Guyger was arrested Sunday on a manslaughter charge in the Thursday shooting. The affidavit says Guyger mistook Jean’s apartment for hers and that his front door was ajar when she entered. She also told investigators that she shot Jean after he refused her verbal commands. An attorney for Jean’s family, Lee Merritt, said at a news conference Monday evening that two independent witnesses have told him they heard knocking on the door in the hallway before the shooting. An investigator says a Dallas police officer who shot and killed her neighbor after mistaking his apartment for her own said that when she inserted her key in his door, it opened because it had been slightly ajar. David Armstrong of the Texas Rangers wrote in an arrest affidavit released Monday that Officer Amber Guyger said it was nearly completely dark inside the apartment when she entered it Thursday night and she thought she was encountering a burglar in her home. He says Guyger said the person ignored her verbal commands and she fired twice. One struck Botham Jean in the chest and he later died. The affidavit says Guyger was on the phone with 911 reporting the shooting when she turned on the apartment lights and discovered she was in the wrong apartment. It says Jean’s apartment was the one right above Guyger’s and the apartment layouts and exterior hallways were nearly identical. David Armstrong of the Texas Rangers wrote in an arrest affidavit released Monday that Officer Amber Guyger said she didn’t realize she was in the wrong apartment until after she shot 26-year-old Botham Jean and went into the hallway to check the address. Guyger was booked Sunday on a manslaughter charge in Thursday night’s killing of Jean and was released on bond. 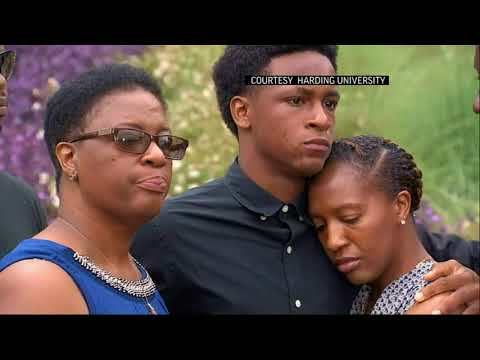 The mother of a man who was gunned down inside of his Dallas home by a police officer who said she mistook his apartment for her own says investigators still haven’t given her family an account of what happened. Allison Jean, whose 26-year-old son Botham Jean was killed Thursday by Officer Amber Guyger, said at a news conference Monday that she’s asked a lot of questions but has been told there are no answers yet. Lawyers for the family questioned why it took three days for Guyger to be charged. One said Guyger should have been in handcuffs the night of the shooting, but she was only booked on a manslaughter charge Sunday night. They also wondered why, based on news reports of what happened, Guyger was so quick to use deadly force. The Dallas County district attorney says her office will present the case of a police officer who fatally shot a neighbor to a grand jury, which could decide that a stronger charge than manslaughter is warranted. District Attorney Faith Johnson said at a news conference Monday that her office will first collect all of the evidence it can surrounding Thursday’s fatal shooting of 26-year-old Botham Jean by Dallas police Officer Amber Guyger. Guyger was arrested Sunday night on a manslaughter charge and was booked into Kaufman County jail and released on bond. When asked why Guyger was allowed to surrender somewhere other than Dallas County’s jail, Johnson said the decision was made by the Texas Rangers, who oversaw the investigation. Police have said that Guyger told officers who responded to the shooting that she had mistaken Jean’s apartment for her own. Guyger was arrested on a manslaughter charge and released on bond Sunday. The Dallas County medical examiner’s office said Monday that Jean died of a gunshot wound to the chest and it ruled his death a homicide. A white Dallas police officer who says she mistook her black neighbor’s apartment for her own when she fatally shot him has been arrested on a manslaughter charge. Officer Amber Guyger was off duty and returning to the South Side Flats, where she and 26-year-old Botham Jean both had apartments, when the shooting occurred Thursday. Many questions remain about what led the officer, who has been on the police force for four years, to shoot Jean. Lawyers for Jean’s family had been calling for Guyger’s arrest since the shooting, saying the fact she had remained free days later showed she was getting favorable treatment. She was arrested Sunday and later released on bond. The group Mothers Against Police Brutality said the arrest is a “first step” toward justice and accountability.